The warmth of memories from this trip are due in great part to the keepers of the stories. The tales shared by others fueled my imagination. If the Swift sisters (Kate, Agnes, Martina and Martha) provided me with the coals, then Uncle Mike and Mom lit the fire, and Sister Joan and Sister DeLourdes poured on the accelerant! John Connell Swift and his younger sister, Mary, stood at the door of the cottage, saying goodbye to their Uncle Paddy and Aunt Mary Connell. They were leaving for America, following the footsteps of their older siblings, Martin and Bridget, who had left two years ago and were settled in a place called Albany, New York. They had written that there was work to be had, and John, at 18 years old, was able-bodied and willing to work. Mary, too, tiny though she was, harbored an energy which belied her few years. She had helped their Aunt Mary cook and sew, and she had kept things going in the household when her aunt gave birth to their new cousin, Bridget, just a few months old now. Things had not been good for them in Ballylee -- or in all of Kiltartan or County Galway for that matter. With the passing of their mother only a few years before and now the failure of this year's potato crop, everyone was struggling. So much hunger. So much poverty. Why, even their brother Martin had applied for relief from the "famine." (Famine! Why, weren't the British exporting the precious food produced by Erin's isle? Didn't they know the people were starving?) But instead of the aid from the relief committee, Martin found passage to America for Bridget and himelf, and they went, as soon as the arrangements could be made. Months later, when Martin's letter arrived, telling how he had found work, Uncle Paddy had urged them go to. They all knew friends and neighbors who had gone to the workhouse in Gort and would never come out. John and Mary were still young. They could still make a change. "There's nothing for you here," Uncle Paddy had said. "Go to America. You can join Martin and Bridget and make a go of it. You'll write and tell us how it is." 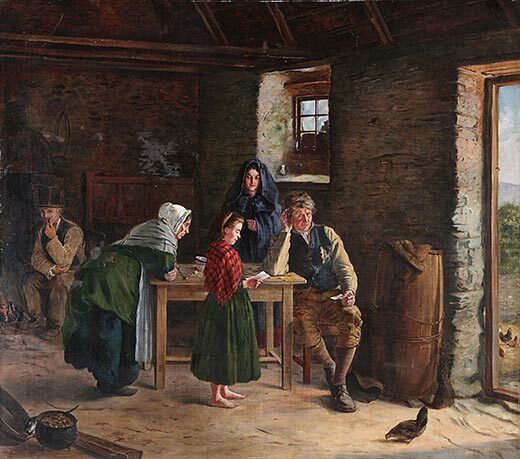 Paddy knew that neither John nor Mary could write the letters, but there was always someone -- a parish priest, a friend, maybe a schoolteacher -- who would help them get a letter back to Ballylee about how they fared in New York. John and his sister put on brave smiles and promised they would work hard, prosper and send word back to Ballylee. Uncle Paddy made it sound so hopeful. But they didn't really know, did they, as they clutched their small parcels and headed down the road toward Gort town -- would they really have a better life in America? Some who had gone to America or Australia had returned with sad stories of how the Irish were treated, crammed into steerage on the sailing vessels or lost among the many thousands in the tenements of the cities. Paddy tried not to think about that as he stood at the gate and watched them go. They were his sister's children, and after their mother died, and John had chafed at the stern ways of his father, Paddy had offered them a place in their home. John had been a help with the fieldwork, and he had a way with the horses. And Little Mary's determination in all things she undertook had been a boon to him and his wife, especially when tiny Bridget arrived. "God be with them!" Paddy prayed silently as he stood there, fighting back the tears. Would they would ever see each other again? "Please God, that they find a life in America," he said aloud to his wife, Mary. And then he added, "Don't let them forget us and Ballylee." Up next: We arrive in Kinvara. Click here to continue reading.